Apple makes big waves with the iPod mini. 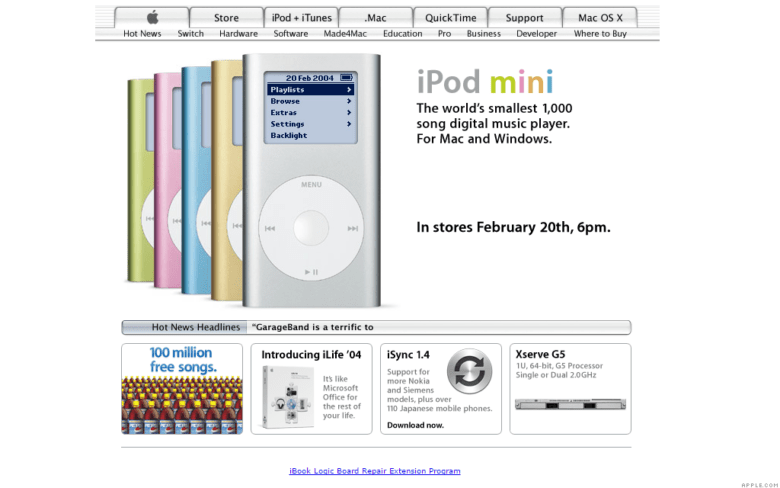 February 20, 2004: Music goes small as the iPod mini arrives in Apple stores. Released with 4GB of storage and in five colors, the diminutive iPod mini features a new “click wheel” that integrates control buttons into a solid-state, touch-sensitive scroll wheel. Despite its small size, the new music player’s market potential looms large. In fact, the iPod mini soon becomes the fastest-selling iPod yet. The iPod mini arrived as the iPod helped erase memories of Apple’s bad old days of the 1990s. 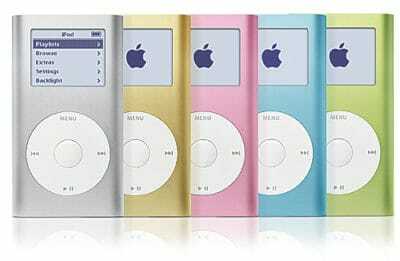 Over the year that followed the iPod mini’s release, the number of iPods that Apple sold rose to a massive 10 million. Meanwhile, Apple revenue increased at a rate previously unimaginable. The iPod mini proved a significant product for Apple. The iPod mini brought incredible miniaturization. Like the later iPod nano, the iPod mini did not try to shrink down everything about its bigger siblings. Instead, it showcased a new way of solving the same problems. In the case of the iPod mini, this meant ditching the physical buttons of the larger iPod Classic for buttons incorporated into the four compass points of the click wheel itself. Apple has embraced the gradual transition away from chunky physical buttons ever since. Just look at the haptic Home button that shipped with the iPhone 7 and the total lack of a Home button on iPhone X and XS. A study in minimalism, the iPod mini looked less like a tech product and more like a stylish Zippo lighter. The iPod mini also marked the beginning of Apple design chief Jony Ive’s obsession with aluminum. Like the plastic iMac G3, the iPod mini came in a variety of colors, achieved in this case using an anodization process. Ive’s team previously used metal for the Titanium PowerBook G4. But while that laptop became a big hit for Apple, titanium proved expensive and challenging to work with. It needed to be treated with metallic paint to stop it from showing scratches and fingerprints. As Ive’s team members researched aluminum for the iPod mini, they fell in love with the material, which brought the twin benefits of lightness and strength. It didn’t take long for Apple to roll out aluminum as a material for MacBooks, iMacs and other products. The iPod mini also began Apple’s invasion of the fitness arena. People began using the tiny music player at the gym during workouts, and Cupertino played up this new use in advertisements. iPods started showing up as accessories that could be worn on the body. Many people who owned a larger iPod with more storage also bought an iPod mini for use while running. Today’s fitness-focused Apple Watch ads owe a lot to the iPod mini’s marketing. The iPod mini also kick-started Cupertino’s fashion-focused advertising for wearable devices. Do you remember the iPod mini? Which version did you have? Leave your comments below.